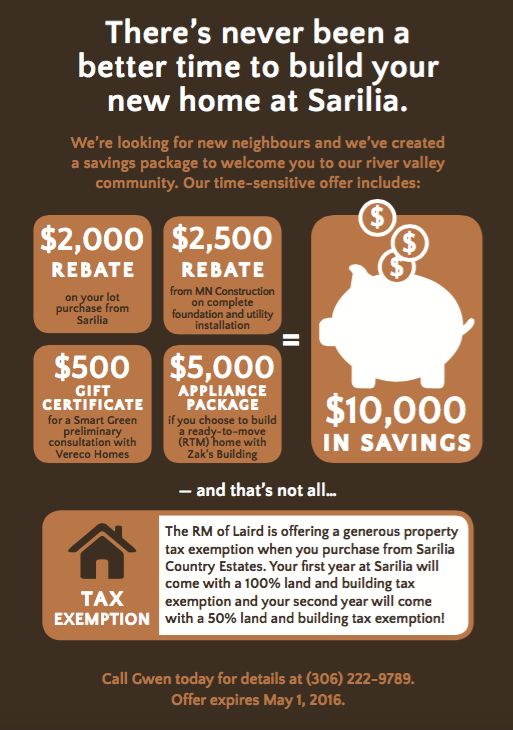 We’re pretty excited about our new Sarilia savings package and we’ve created an infographic to explain all the juicy details. From generous rebates, to free appliance packages, to gift certificates and property tax exemptions, you won’t want to miss out on this incredible deal. Have a look, and contact Gwen for further information or to view one of our river valley lots. Act quickly as our offer expires one year from today! MN Construction – No current website, but contact Mark, the owner, at (306) 361-3910 or Gerald, the manager at (306) 380-4734. We can’t wait to get our hands dirty in the community garden this spring and summer. In the winter, some of us almost go into gardening withdrawal. But, there’s a bit of a cure for that — and that cure is to fill your home with beautiful house plants. We love our succulents and one of the great things about them is that they multiply if you learn how to propagate them properly. 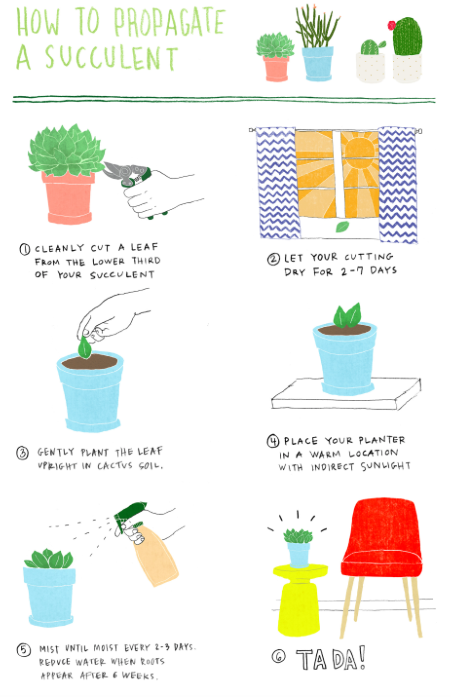 Here’s a nicely illustrated how-to guide we found on West Elm’s blog. If you don’t yet own one of these magical multipliers, you can find them right in Sarilia’s backyard at Dieter Martin Greenhouse in Langham. Just tell them Gwen sent you. Our community here at Sarilia is made up of a lot of adventurous and outdoorsy people who were attracted to life in the river valley and all the perks that come with it — from the nature trails, to the beautiful beach and the North Saskatchewan River access. Many of us love to launch our kayaks and canoes here and venture out on the water. It’s a chance to stretch our limbs, breathe the fresh air and appreciate the incredible beauty of mother nature. 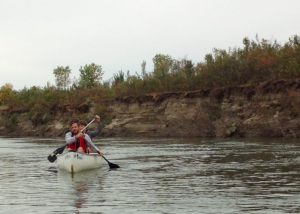 It’s this passion for paddling that inspired us to share three of our favourite places in Saskatchewan to row, row, row our boats – or paddle – gently down the stream. We’ll start off with tooting our own horn a little, but hear us out! The winding North Saskatchewan River is simply spectacular. When you launch at Sarilia you can paddle downstream as far as you like — all the way to Hudson Bay if you were so inclined! If that sounds a bit too taxing to tackle, a nice two-hour journey from the Borden Bridge to Sarilia is a soothing – yet stunning – 20 kilometre stretch downstream. You may even be greeted by a moose! We’re not kidding — last year we saw a moose swim across the river near Sarilia’s beach. 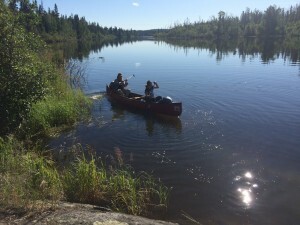 Sarilia developer and resident Ronn Lepage says Barker Lake is his “favourite place in the whole world.” Every summer he organizes an epic trip with friends and family and sets up camp in the beautiful Canadian Shield. “It’s not just great canoeing, it’s great camping too,” says Ronn. There are at least 20-30 sites for camping, but Ronn recommends the beautiful Muchaye Island as a convenient base to take day trips from. To reach Barker Lake, you drive 80km past La Ronge to Missinipe. 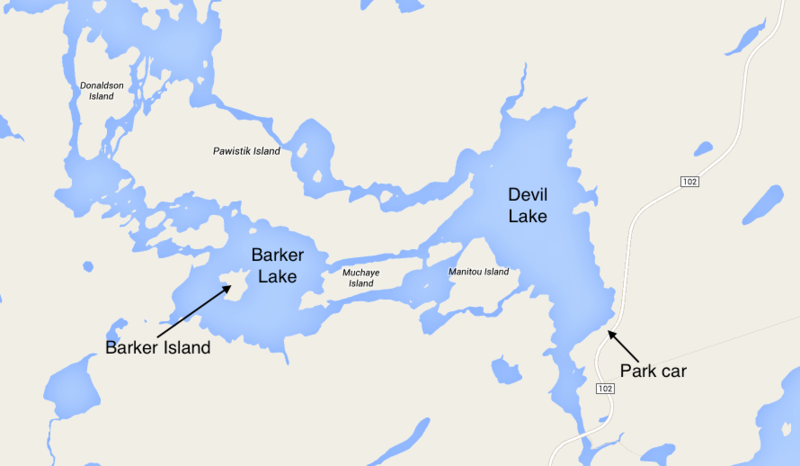 You can park your car at the Devil Lake campground and paddle to Barker Lake within one hour (including a short portage). There are a number of rapids to test your mettle, and it’s a great spot to cast a line. Ronn has spotted moose, eagles and pelicans on his trips, not to mention all the lush vegetation, flowers and Saskatoon berry bushes. Whether you’re a beginner or a highly experienced paddler, Barker Lake has something for everyone — even music lovers. Every year Churchill River Canoe Outfitters hosts the Whitewater Festival on the last weekend in June. They bring in a band by boat and host an outdoor concert on Barker Island. Upwards of 90 passionate paddlers attend this festival each year, making it a great opportunity to meet and break bannock with others who share a love for the great outdoors. 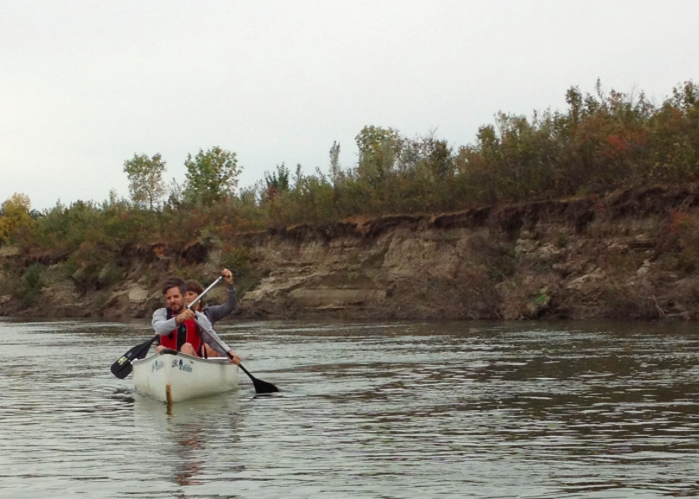 If you don’t have a full weekend to spare, a fun, leisurely half day on the water starts with launching at the Berry Barn and paddling about 20km to Downtown Saskatoon. If you don’t own a kayak or canoe, you can rent one from Eb’s Source for Adventure. Plan to kick off your day early so you can take a break on one of the sandbars just south of downtown by noon. The sandbars are a great place to enjoy a picnic lunch. The dock at the Saskatoon Rowing Club on the river’s left bank is a simple spot to disembark. Keep your eyes peeled for beavers! We’ve seen some well fed ones on the islands you’ll paddle past on this route. So there you have it – three great options for getting out on the water this spring and summer. Where is your favourite place to paddle?